Remove the side defroster ducts (LH/RH). Refer to VTL-7, "SIDE VENTILATOR DUCT : Removal and Installation". Remove the defroster nozzle screws. Remove the instrument panel assembly. Refer to IP-14, "Removal and Installation". Remove the center ventilator duct screws. Remove the center ventilator duct. Remove the side ventilator duct screws. Release the side ventilator duct from the defroster duct and remove. Remove the center console side finisher. Refer to IP-17, "Exploded View". 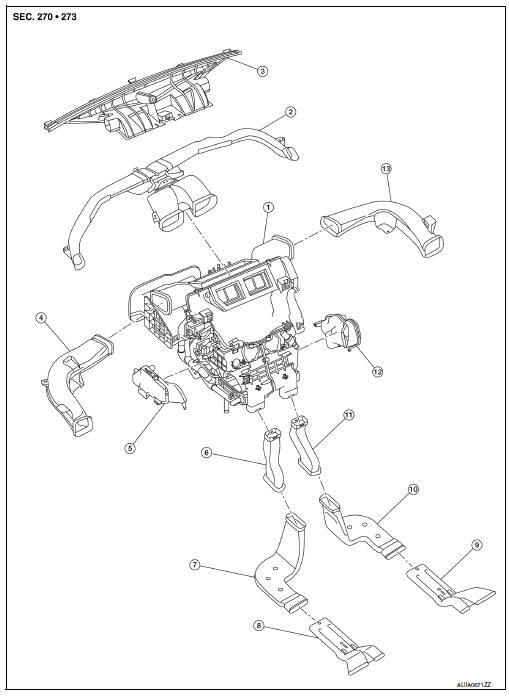 Remove the rear floor connecting duct (LH/RH). Remove the front floor trim. Refer to INT-35, "Removal and Installation". Release the rear floor duct nozzle from the rear floor duct and remove. Remove the rear floor duct. 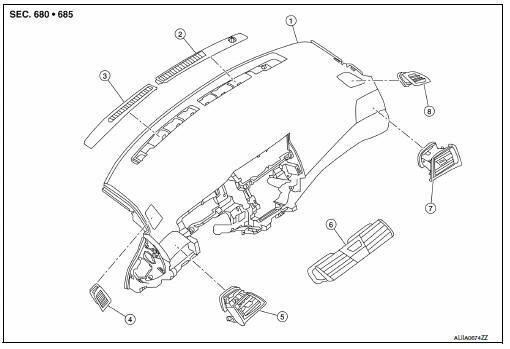 Refer to VTL-8, "REAR FLOOR DUCT : Removal and Installation - Rear Floor Duct Nozzle". Remove the rear floor duct nozzle (LH/RH). Release the defroster grille pawls using a suitable tool. Remove the defroster grille (LH/RH). Remove cluster lid C. Refer to IP-20, "Removal and Installation - Cluster Lid C". Release the center ventilator grille pawls using a suitable tool. Remove the center ventilator grille (LH/RH). Remove the instrument side finisher. Refer to IP-14, "Exploded View". Remove the side ventilator grille screw (A). Remove the side ventilator grille (LH/RH). Remove the center ventilator duct. Refer to VTL-7, "CENTER VENTILATOR DUCT : Removal and Installation". Release the side defroster grille pawl using a suitable tool. 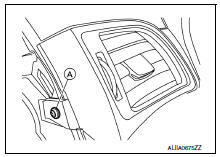 Remove the side defroster grille (LH/RH).